A relative minimum of a function is the smallest value the function can take on a particular subdomain of that function. McAdams, David E. Relative Minimum . 12/21/2018. All Math Words Encyclopedia. Life is a Story Problem LLC. 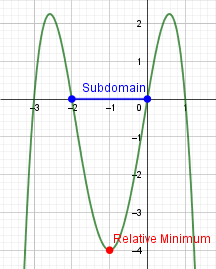 http://www.allmathwords.org/en/r/relativeminimum.html.